Enable free SSL (Https) encryption for blogger-So let's see how to make this website Secure Sockets Layer. So we will use CloudFlare provide for using the flexible SSL and getting a lock mark right here. Cloudflare provide you free SSL for per account if you have any other websites you need to upgrade CloudFlare account. You can add your custom domain in blogger Blogspot, WordPress etc. All of the information of the Internet is basically transferred from one location to another location in a language called HTTP which stands for Hypertext Transfer Protocol now HTTP by itself is unprotected tricksters and thieves. 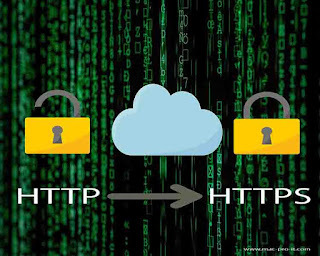 So a technology called SSL or Secure Sockets Layer was developed to protect the information traveling on the internet when HTTP is being projected by SSL it inherits the letter S which means its secure SSL keeps your information secure in two separate ways the first is by encrypting your data. Copy the URL of your website and go into CloudFlare let's add it to our websites so for this you need to login to your CloudFlare account and there is an option here for add assignment so let's paste on with the manual here.we will choose the free website plan and click continue. CloudFlare is scanning our domain okay so as you can see task complete with the scanning it shows continuing setup so let's continue it here it shows different IP record types that can and cannot be managed by CloudFlare. So now this is the main part we have to change our name servers in our domain. So now it shows the new name server details that we need to input at our domain configuration portal let's do this here is our domain configuration portal for this demonstration. I have registered a domain name from Namecheap domain name is study material dot COM. So this is the configuration page and let's see name servers so these are the names of us that have configured currently. Let's update them with the new ones let's copy it from Cloudflare and paste it and let's do the same for the second one and series remove these Namecheap name servers so let's remove. These large stores let's change the name servers change now the changing of the nameservers actually take something wrong one or two 24 hours. So let's wait for some time then we can continue now at this time it shows the status is pending it says to allow 24 hours also change to facility let's wait for some time and then we will check for the internals. So let's check for the name servers whether they are being updated or more by clicking here recheck names always so yes the setup has been completed partially so let's continue now as you can see the domain is correctly added. So let's continue with the or next step now here we can see that the free SSL is fine now let's go to the SSL and click confirm change it to flexible and scroll to the end now there is a button that says automatic HTTP rewrites so what it does is whenever there is an HTTP request it automatically responses with an HTTPS. So it does not allow mix content warning and that kind of stuff so let's switch it on this will fix many errors in your website actually many potential errors which might come like when your ferry like an icon for the website is not over the secure domain name. If you are looking for secure your website enable HTTP to HTTPS this "Enable free SSL (Https) encryption for blogger" article will clarify to understand easily. Share this article to other's people to make your website free SSL certificate.